Oklahoma City is certainly not the first place that comes to mind when you think of "rock music". In fact, the city is much better known for such attractions as the International Gymnastics Hall of Fame, The National Cowboy and Western Heritage Museum, and the federal bombing memorial. Deep in the heart of the city, though, lives a tried and true rock band. The kind of rock band whose songs can make you feel like you're their closest confident and at the same time challenge your mind and even shake your very soul. They go by the name Radial Angel....and they ain't country, "pardner". Radial Angel was born in 1999 and since then the band has achieved tremendous success both as an independent band and as a member of Warner Bros. Records' Squint division (the imprint that spawned such top-selling acts as Sixpence None the Richer, Burlap to Cashmere, and Chevelle). Radial Angel has released four independent albums, with sales topping 30,000 units. 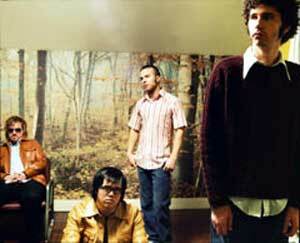 In 2001, the band was named one of the Top 20 Impacting New Artists by Progressive Airplay Journal. Their major label debut One More Last Time was produced by Kevin Lively (Rage Against the Machine, Stone Temple Pilots) and also spawned a radio favorite in the single "She." This led to a massive amount of press and radio airplay, the kind only major labels can bring you. Many people took notice of this young band and the future looked extremely bright. Then unceremoniously Squint Entertainment dropped all their "rock bands." Shortly thereafter the imprint dissolved. For a lot of bands, hopes of a brighter future may have quickly faded, but not for Radial Angel. When the dust began to settle, the band entered the studio to record their EP, Summer Fade. The band hoped this release would prove to industry and fans alike that Radial Angel wasn't going away; in fact they were at the top of their game. GRAMMY nominated producer, Eric Delegard, was enlisted to guide Summer Fade and the result is the band's strongest rock record to date. The powerful epic anthem "Not Beautiful" is an undeniable example of this band's maturity and has been an immediate hit with fans all over the country. Further releases from the EP will undoubtedly follow suit. No matter which album you're talking about, though, one thing always remains the same. The fact is that when you hear Radial Angel for the first time you will certainly notice the band's intelligent and emotional approach to their sound. For the guys in Radial Angel, being positive, but also real, is of the utmost importance. "Our lyrics are usually very personal and generally deal with things that have happened to me, us as a band, or someone we know. Our hope, though, is that people will relate to them on some level and that that will bring some kind of emotional attachment for the listener," says vocalist Jared Taber, the band's chief lyricist. And, while many bands are content to simply entertain their audience, Radial Angel would rather align themselves with artists who desire to change their world for the better. "We definitely want to make an impact on the world. We feel more like artists than entertainers in that respect," says bassist Eddie Jones. Don't let the word "artist" mislead you. This is a band that knows how to play live...and play well. Don't take my word for it -- just ask any of the 90,000 or so people the band has played for this year alone. Having been on a nationwide "Acquire the Fire" arena tour earlier this year as well as keeping their own touring schedule, Radial Angel is a hard-working band by anyone's standards. Having toured extensively in 2003 as well, first with The Elms and Holland and then headlining the "Can't Stop the Rock" tour, it's almost unbelievable that this foursome slowed down long enough to record anything! The band has also performed at almost every major festival in the United States and has played alongside such hot acts as Blindside, Switchfoot, and The Evan Anthem. Radial Angel is one of the most accessible acts in the world of music right now. Their "pop from a rock perspective" approach touches almost every music fan in some way and their track record undoubtedly proves just that. They have seen what life is like as a successful independent band and likewise they have seen what life is like as a major label artist. Through the good and the bad these four guys have remained true to not only who they are as individuals, but also to what Radial Angel is as a band. Radial Angel has the passion of "Sixteen Stone" era Bush, the crunching riffs that took bands like Creed and Nickelback straight to the top of the charts, and the intelligent and emotional approach that made Our Lady Peace a staple in CD players all around the world. Simply put, Radial Angel is a band well worth your attention, so don't be shy "pardner", get on board and enjoy the ride!